Complete Dentures– Upper or Lower removable prosthesis which replaces all of the missing teeth and structures of maxilla or mandible. Partial Dentures– Upper or lower removable prosthesis which replaces some of the missing teeth of the maxilla or mandible and is supported by natural teeth and usually a wire clasp in most cases. Partial dentures are made up of only acrylic or with metal to reduce the bulk and increase the strength, known as cast partials. Flexible Dentures– Flexible dentures are made up a softer material and without metal clasps as to blend in with the natural gum colour. They are more resistant to cracks and break than normal dentures. Immediate Dentures– As the name suggests, Immediate dentures are placed as soon as the natural teeth are removed and the patient does not have to go home without teeth. It also aids in healing of the gums post-extraction. A reline or adjustment is needed once the gums have healed for a better fit. Implant Overentures– Implants are the next best thing to mimic natural tooth. When a full arch rehabilitation is not possible due to financial or physical constraints, Implant overdentures are the next best thing. An Implant over denture can be placed on a small number of implants (usually 4) and a denture is fabricated on top of it, giving it stability, retention and aesthetics. Reline– Reline is a procedure used to resurface the tissue side of a denture with new base material for better adaptation. Rebase– Rebase is a process of replacing all the base material of a denture, and only the original teeth and their arrangement remains. 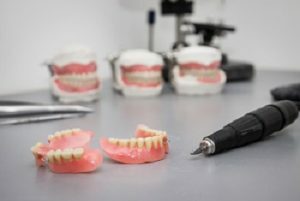 Repair– A denture repair is done, so that it can closely re-establish the function and aesthetics before the break, which can happen if a denture falls, or cracks while eating something hard, or a tooth can come out. Dental Hygienists are licensed oral healthcare professionals who work independently or alongside Denturists and Dentists to provide complete oral health care to patients. Dental hygiene is the prevention of infectious disease of the teeth and gums by performing oral examination, regular cleaning , polishing and fluoride treatment when necessary. Scaling is a the removal of plaque and calculus from teeth which helps to reduce inflammation of the gums to help minimize gum disease. Polish is done at the end of treatment to help remove any extrinsic staining on teeth. Fluoride is given to hep reduce the formation of caries and remineralize tooth surface. Desensitization Is done when you experience sensitivity to hot or cold food/ drinks. It helps you eat and feel better. Mouth/ Sports Guard prevents your teeth from injury if you play any kind of sports and are highly recommended. 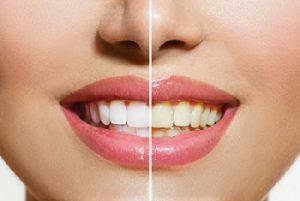 Teeth Whitening is a cosmetic procedure done to reduce surface stains on the teeth while improving aesthetics by brightening the smile. It can be done in-office or in-home by a whitening kit. Dental Hygiene is a major part of your overall dental health care plan.